Product #21837 | SKU SV4C-350 | 0.0 (no ratings yet) Thanks for your rating! The Pearstone Gold Series Premium S-Video Cable is a high-quality affordable S-video cable that provides users with professional-grade features. It is designed to provide the most accurate signal transfer, with minimal loss of fidelity. It can be used with any type of video equipment that uses S-video connections. Pure OFC (oxygen-free copper) wiring - with two layers of insulation - is used for the core of this cable. Encasing the OFC wiring is a rugged SuperFlex PVC outer jacket that is both durable and flexible. The corrosion-resistant connectors feature a positive-grip strain-relief shell, 24k split-pin contacts, and 24k gold-plated terminations. 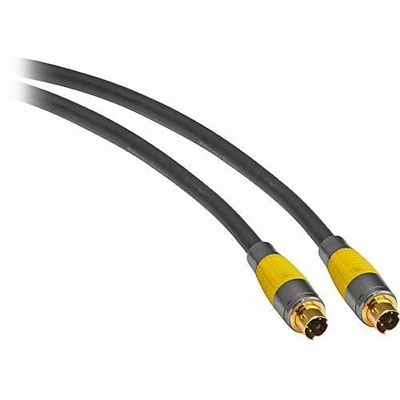 This Pearstone cable is a quality video interconnect that ensures a clean and superior video signal, and is ideal for a wide range of component and video applications.